Detectives apprehended two alleged drug dealers on Wednesday afternoon at the intersection of East 26th Street and 14th Avenue seizing 890 glassine envelopes of heroin, according to Passaic County Sheriff Richard Berdnik. 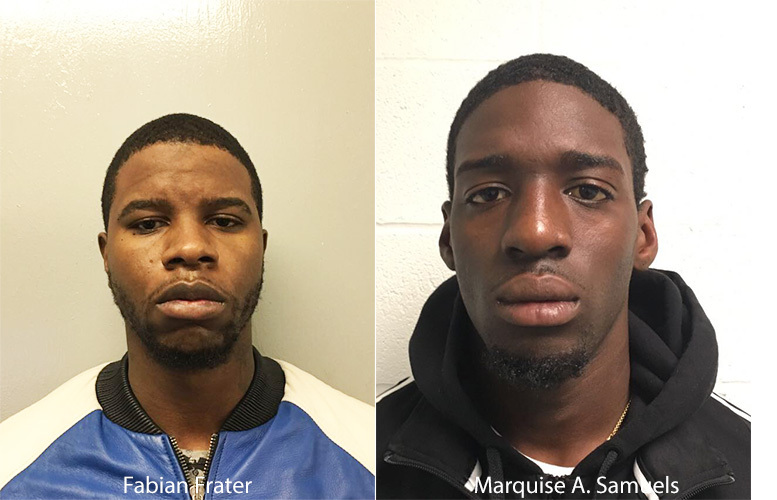 Fabian Frater, 28, and Marquise A. Samuels, 18, both of Paterson, were arrested on multiple possession and drug distribution offenses at around 4:30 p.m., authorities said. Both alleged drug dealers were observed conducting a sale at the intersection. Detectives observed the two men conduct the transaction. Frater left in a black Audi and Samuels in a Nissan Altima with detectives behind them. Samuels was pulled over and 310 glassines of heroin was confiscated. Frater was pulled over and arrested for making the sale to Samuels, authorities said. Detectives seized $1,190 in cash from Samuels. Both suspects’ homes were searched, authorities said. Detectives recovered 450 glassine envelopes of heroin and 326 grams of marijuana from Samuels’ residence at 507 East 26th Street. $722 in suspected drug proceeds was confiscated, authorities said. Detectives seized 130 glassine envelopes of heroin and $1,070 in cash from Frater’s residence at 9 East 21st Street. Authorities said drugs seized is valued at $7,000. Samuels is being held at the Passaic County Jail on a warrant. Fraters was released pending a court appearance. 18 years old and now with a record, good luck with future job prospects.